Ever heard of Tun Aung? I hadn’t until researching my recent Reuters special report on Myanmar’s year of reforms. Human rights activists claim his plight is proof that the country’s reformist government, like the military junta it replaced, still relies on repressive laws and secretive trials to silence perceived enemies. He was not allowed to choose his own lawyer, nor to meet privately with his state-appointed one, “giving him no chance of a fair trial,” says Amnesty. Even so, Tun Aung was sentenced to a total of 15 years in jail. Seven of them were for offenses under the Emergency Provisions Act (1950), one of a number of laws “commonly used to arbitrarily detain activists or criminalize dissent” under Myanmar’s old junta, according to the Assistance Association for Political Prisoners (AAPP). These laws, which still remain on Myanmar’s books, help create “an environment conducive to politically motivated arrests,” says AAPP. At least 200 dissidents remain behind bars, says the group. 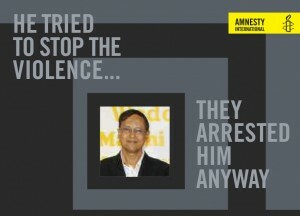 Amnesty has designated Tun Aung a prisoner of conscience and called for his immediate and unconditional release. He could be granted a presidential amnesty “before too long,” reported The Irrawaddy. Maybe. Or President Thein Sein could decide that keeping 200 or so people behind bars is no big deal. After all, Myanmar’s more developed Southeast Asian neighbors still routinely incarcerate citizens for their political views. Indonesia has about 76 prisoners of conscience, most of them jailed for peaceful political expression in the restive provinces of Papua and Maluku, says Amnesty. At least 31 activists and dissidents were jailed in Vietnam in the first nine months of 2012 alone, estimated Human Rights Watch. And dozens—perhaps scores—are serving lengthy sentences in Thai prisons under draconian laws that forbid even mild criticism of the country’s monarchy.